With the advent of many new types of technology, the landscape of child custody is rapidly changing. Several states including Texas have passed laws that allow virtual visitation as part of a parenting plan in child custody agreements. Virtual visitation includes software application like Skype, video phones, and webcams and significantly helps parents maintain regular contact with children after a divorce. Virtual visitation proves to be particularly beneficial in situations where one parent is in a different location due to military service or the demands of a career. In 2007, Texas became the third stage to incorporate law regarding virtual visitation between parents and children. This provision of Texas law called the “Electronic Communication with Child by Conservator” establishes some specific about virtual visitation. 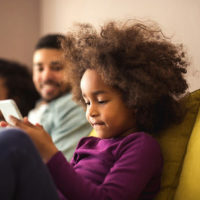 Divorcing parents can agree or Texas courts can order “reasonable periods” of electronic communication between a parent and child or children to supplement that parent’s actual physical interaction with the child. In deciding whether to order a virtual visitation schedule, court’s order analyze three factors: (1) whether electronic communication is in the best interest of the child, (2) whether equipment to facilitate virtual visitation is “reasonably available” to all involved parties, and (3) any other factors that the Texas courts deems to be appropriate. While phone calls were once used as the primary virtual visitation tool, an increasing number of Texas parents are relying on social media and video conferencing through programs like Skype, Facetime, and Facebook to interact with their child or children. Parents in Texas who are interested in implementing virtual visitation in a parenting plan should understand some of the particular benefits offered by these types of arrangements, which include: parents can maintain an active role in a child’s education by helping the child with homework; parents are able to read the child a bedtime story without actually being inside of the child’s house; communication is direct despite a potential great distance between parent and child; parents who live a significant distance from their child can easily see the child face; and parents are able to live-view important activities in the child’s life like games and recitals. There are some particular drawbacks to the decision to implement virtual visitation with a couple’s parenting plan. One of the largest drawbacks is that virtual visitation is not a proper substitute for physical contact and interaction with a child or children. Some parents are particular concerned that virtual visitation will eventually replace physical visitation with a child or children. This fear, however, fails to take into consideration that courts primarily assign virtual visitation with the intention to supplement rather than replace physical interaction. Divorced or separated parents do not need permission to visit with children online, but if parents are able to decide on the terms of electronic communication with the couple’s child or children, a knowledgeable lawyer like the legal counsel at Lindamood & Robinson, P.C. can help make sure that a Texas court clearly orders these terms in a parenting plan.